While we are on the topic of CPU mining crypto coins, after going though the currently available alternative crypto coins that are still mineable only with CPU there is pretty much only one that stands from the crowd and that is Coin Magi (XMG). Sure, there are a few more coins that are still CPU only, but their developers are not very active, nothing much is happening there and the community around the coins is pretty much disappearing. 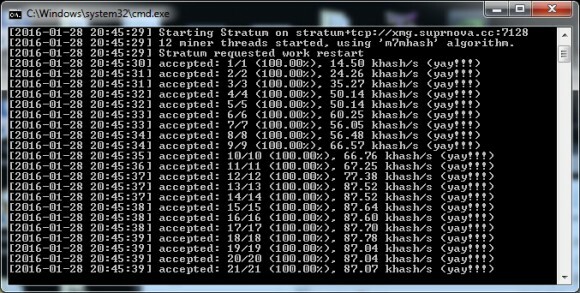 With Coin Magi however it is quite the opposite, active developers and large community supporting the coin and mining it even though XMG is already entered its POW-II stage with the reward per block in between 3 and 50 XMG unlike the first 50K blocks (POW I stage) when it was between 5 and 300 XMG. Do note that Coin Magi is also a POS coin, though it uses a so called POS-II algorithm that makes it a bit more complex for the calculation of the interest rate of staked coins. Since we mentioned complex, this seems to be one of the issues that XMG is facing and one of the main problems that are hurting the coin – there is so much information and things happening about the coin all of the time that it is hard to keep a track on all things for a lot of users. You need to be following closely the development of Coin Magi all of the time and be a bit more advanced crypto currency user to be up to date with everything and a lot of the users are in fact not doing that. The team behind XMG needs to summarize all of the important information about the features and development of the Coin Magi in a brief and user friendly way and instead of pushing too much information to users that don’t know what to do with it ti present them with the important details in short. Anybody that is advanced user or wants to dig up into details can start researching things deeper, but for the people that don’t there is no need to dig deeper than they should just to get the basics of the coin as it is in the moment. This by the way is not a problem that only XMG has, many other alternative crypto coins suffer from a similar problem – ether lack of enough information or with too many details that make it hard to grasp the basics. One of the latest things happening around the XMG is the launch of their Coin Magi payment gateway called MagiPay, designed for merchants that are interested in accepting the crypto coin as a form of payment. Unfortunately another example of too much and unclear information as we cannot really get if the gateway is already launched and working, there is a website available that seems to be operational, or it will be launched on March 6th. If they start managing things better and actually make it easy for the users the coin can continue to grow as it already has a big community, both mining and trading, is traded on some of the larger altcoin exchanges and has a relatively stable exchange rate. So if you haven’t heard of Coin Magi (XMG), then you might want to take a look at it as there are other interesting new features planned for the future. We haven’t talked about crypto coins that are mineable with only CPU and do not have a GPU or ASIC miners lately, but with the not so attractive options for GPU ans ASIC mining lately people are starting to look for some CPU coins again. Looking around through the more recent launches that still remain CPU only one coin catches our attention, it is called Coin Magi (XMG). This crypto coin has been available for a few months already and thanks to the use of a new algorithm called M7M (improved version of the M7) it still remains a CPU only coin. The coin uses a hybrid proof of work and proof of stake algorithm and a block rewarding system to enable fairness in the distribution of coins among miners. By removing the competitive nature of mining, the XMG tries to offer an even playing field for anyone looking to mine currencies without the need to own expensive mining hardware. The Coin Magi (XMG) is already quite developed and is supported by multiple exchanges, has numerous pools and even a multipool where you can mine other coins and get paid in XMG, there is currently an ongoing effort for introducing a PayPal-like payment system to use XMG called MagiPay. It is not too late to join the party if you have some spare CPU power, though there are a little over 5000 blocks left in the PoW phase of the coin before it enters the PoS stage. Even if you do not have enough CPU power to try mining yourself, you can rent some M7M hashrate for mining XMG from Mining Rig Rentals where currently we see 18 rigs available selling hashrate for the M7M algorithm.